When they say “don’t feed the animals”, they mean it! The Daleks and their Werelok slaves slowly destroy the New Earth system. The Doctor, K-9, and Brill (the Werelok the Doctor hypnotized into joining them) invade the ship of the “evil ones”. Sharon is forced to stay behind but sneaks aboard Joe and Babe’s ship as they plan to make a suicide run on the Dalek ship, but Joe shoves her and Babe (who has children) into an escape pod. Back on the Dalek ship our heroes discover an alien zoo the Daleks plan to use to create more Daleks (I guess these aren’t from the purity faction), but K-9 blasts the cage doors and the creatures attack the Daleks. The trio discover time travel equipment aboard the ship and the Doctor uses it to defeat the Daleks before Joe can complete his run. Brill decides to stay on New Earth and teach their soldiers and Sharon tries to convince the Doctor to not send her home just yet. What they got right: A clever plan by the Doctor (naturally), and it’s something New Who would later pull during the Time War with Rassalon and the Davros Daleks. Brill was kind of fun to watch in his glee of killing “the evil ones” and I’m going to miss him. He could have been the next Leela but I don’t think he would fit with the next story anyway. I like Joe’s line “It’s just a short haul to nowhere!”. It is a good line. What they got wrong: Unless she’s there just to give Joe an excuse to get Babe off of the ship for the kids’s sake (hers, not the readers), Sharon showing up on the trucker ship is kind of pointless. The next story starts here with one strip because of how IDW collects these old magazine stories and I still prefer how Marvel did it. (We will get back to that run soon.) On the planet Nefrin a woman named Brimo is punished for her misuse of her psychic powers by being locked in the Eternity Capsule, which will keep her alive throughout eternity. (Hence the name.) However, this includes the destruction of the planet, the sun going nova, and a black hole drawing her and the capsule into a “blank dimension”, which frees her from the capsule and able to create whatever she wants with just a thought. However, the TARDIS is sucked in as well and split in half, the Doctor and Sharon separated from K-9. What they got right: I like the concept, but with only five pages I can’t really judge the full story just yet. The Doctor uses a machine that can instantly add knowledge but accidentally shows Sharon the “Galactic Crimefighter’s Handbook” instead of “advanced high school physics”, which may come in handy later on. There’s also a neat thing in the void where the narration starts to fade. What they got wrong: If the beginning of the story takes place before Earth is even formed why does Brimo look like a blue elf instead of the bug-eyed monsters of the other Nefrin natives? 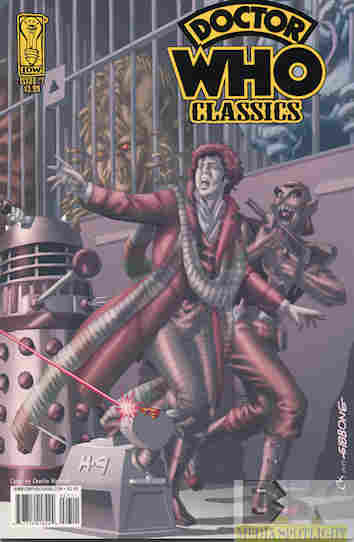 Recommendation: “Dogs Of Doom” is good, if rather violent for a Doctor Who story (which the comics at the time were). It’s worth looking into. “The Time Witch” I’ll have to wait for next time to properly judge the full tale but it’s a nice start. I still think the Marvel run formatted these better. Posted by ShadowWing Tronix on September 26, 2018 in Television Spotlight, Yesterday's Comics and tagged Daleks, Doctor Who, IDW Publishing, K-9, Sharon Davies, The Fourth Doctor.